Almost 40 years ago, the “killing fields” came into existence. What are the “killing fields”? This was a term coined by Cambodian journalist Dith Pran whose story was depicted in the 1984 movie by that name. 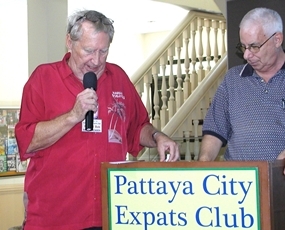 In introducing the presenter at the May 6, 2012 meeting of the Pattaya City Expats Club, Master of Ceremonies Richard Silverberg explained that club member David Garmaise’s hobby is to make video clips from movies and other video sources to share with others. David explained that unlike his previous more light hearted themes, what he would share today was entitled “A Journey through the Killing Fields” and consisted of various clips from the 1984 film. He said he would intersperse the video clips with some commentary about what the movie depicts, which is a dramatization of real events that took place in Cambodia. The Killing Fields are a number of sites in Cambodia where large numbers of people were killed and buried by the Khmer Rouge regime, during its rule of the country from 1975 to 1979, immediately after the end of the Cambodian Civil War. David cautioned that a few of the scenes were disturbing. Board member Richard Smith updates PCEC members and guests on some of the clubs activities for the week. The film is based on the experiences of two journalists: Cambodian Dith Pran played by Haing Ngor and American Sydney Schanberg played by Sam Waterston. David mentioned that Haing Ngor, who played Pran, was a Cambodian doctor who was also a victim of the Khmer Rouge and like Pran escaped from Cambodia. The movie starts in Phnom Penh in May 1973 with Schanberg returning to Cambodia where he learns from Pran that an American B-52 bombed a town in Cambodia by mistake. The first video clip presented involves Schanberg’s not being allowed by a US Army major to go to the area and how he and Pran went by boat to the area and what their visit revealed. The next and subsequent scenes shown by David take place in 1975. The embassies are being evacuated in anticipation of the arrival of the Khmer Rouge and Schanberg secures evacuation for Pran, his wife and their four children. However, Pran insists that he would stay behind to help Schanberg. His family leaves. Later scenes show what transpired shortly after and how they wind up at the French Embassy and stay there for several days, awaiting their chance to evacuate. Informed that the Khmer Rouge have ordered all Cambodian citizens in the embassy to be handed over and fearing the embassy will be overrun, the embassy complies. Pran is turned over to the Khmer Rouge and is forced to live under their totalitarian regime. 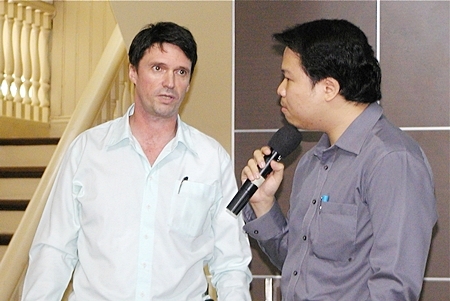 Pattaya City Expats were fortunate to have another of fellow member David Garmaises movie presentations on the 6th of May. This time it was a more serious topic, titled ‘At Trip Through ‘The Killing Fields’. After returning to New York City, Schanberg is in the midst of a personal campaign to locate Pran. He has appealed to many humanitarian organizations and has kept in close contact with Pran’s family in San Francisco. In Cambodia, Pran has become a forced laborer under the Khmer Rouge’s “Year Zero” policy, a return to the agrarian ways of the past. Pran labors in rice fields and is forced to attend propagandist classes. As intellectuals are made to disappear, Pran feigns simple-mindedness. Eventually, he tries to escape. Before he is recaptured, he slips into a muddy cesspool filled with rotting human corpses; in doing so, he stumbles upon the infamous killing fields where Cambodian citizens were murdered by the new order. Another scene shows Schanberg receiving a journalism award for his Cambodia coverage. At the acceptance dinner he tells the audience that half the recognition for the award belongs to Pran. A popular PCEC special interest group is ‘Frugal Freddy’, organised by ‘Hawaii Bob’ Sutterfield, 2nd from left. Frugal Freddy’s theme is finding and dining at Pattaya’s better quality but inexpensive restaurants. Here a happy group enjoys the fine Indian food of Baadshah Restaurant, on Third Road. David concluded the presentation by showing the scenes where Pran makes his way to the border after escaping again and sees a Red Cross camp near the border of Thailand. The scene shifts to Schanberg calling Pran’s family with the news that Pran is alive and safe. Soon after, Schanberg travels to the Red Cross camp and is reunited with Pran. Asking Pran to forgive him, Pran answers, with a smile, “Nothing to forgive, Sydney”, as the two embrace and John Lennon’s song Imagine is heard in the background. Journalist Dith Pran is recaptured following his first escape from the Khmer Rouge. Dith Pran’s part was played by fellow Cambodian Dr Haing Ngor, who had similarly lived through and escaped from the Khmer Rouges anti – intellectual reforms. Richard then updated everyone on upcoming events and called on Roy Albiston to conduct the always interesting and lively Open Forum where questioned are asked and answered about expat living in Thailand; Pattaya in particular. The Pattaya City Expats Club meets every Sunday at the Amari Orchid’s Tavern by the Sea Restaurant. Read more about the Club’s activities on their website at www.pattayacityexpatsclub.com.